Sunnin' In the City: Deja Vu or a Curse? Deja Vu or a Curse? Ok, so is it a coincidence that it seems that every time I get a little break (a few hours off without Caiden and Dave) something seems to go wrong? Dave went to play poker this weekend, and Caiden stayed that night at his Papa Lance's house. I had a few hours to do whatever, and I apparently chose to sleep. I didn't mean to...I had BIG plans for myself, but when I sat down to watch a show, I woke up about 20 minutes in and realized I hadn't seen any of it. I decided to go to bed. I know, thrilling time, eh? 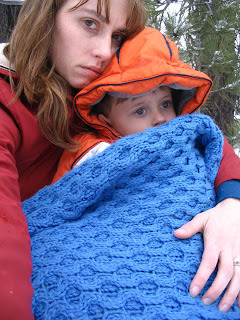 The next day we decided to go to Big Bear. We took the Sentra as we JUST got it back this week from the repair shop from my last "break" without the boys. 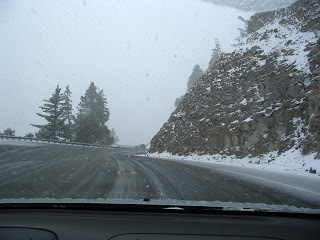 It had not been snowing, so we decided to take the Sentra as it got better gas mileage. 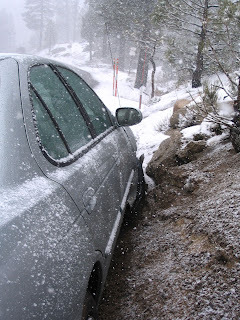 Well, as you can tell from the earlier posting, it snowed in Big Bear. 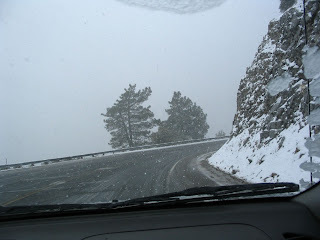 We chose to leave early as the snow was not letting up, and we did not have 4 wheel drive power, or chains for this car. 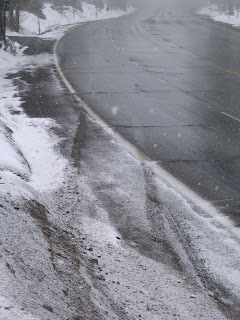 Dave and I had some "discussions" while we drove about the need to drive slowly due to the conditions. We had JUST passed some vehicles when Dave's ability to steer was lost (he could spin the wheel, but it wouldn't do anything)...which of course on a windy, snowy road can only mean one thing. That's right...an accident. 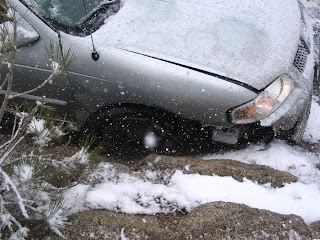 Since he was left without the ability to control the car we headed straight for an embankment, hit the embankment, then started to go up it so the car tilted (driver side down). I completely thought that we were going to flip. Thank goodness I had eaten a bite of Jim's pie the day before because we came to a stop right side up against a rock. We aren't sure what happened except that Dave thinks that we popped a tire. Unfortunately, the car was not drivable, and smelled like gas, burning, tires, and whatever else. We got out of the car (in case another car suffered the same fate and crashed into us). 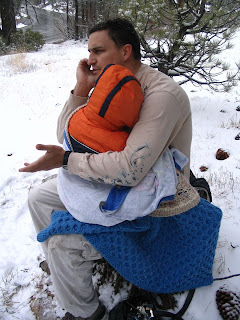 We hiked a bit up the mountain and then I laid my jacket (I always have spares because I am always cold) on a tree stump and then covered Caiden up with afghans that I was just given (Grandma Sara had made them) until help could arrive. 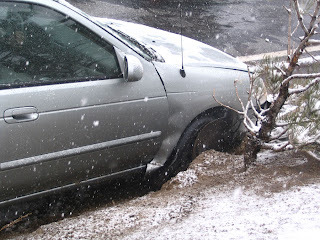 I called Jim and Sue and then the insurance company and AAA. The car has been towed and Jim and Sue were kind enough to drive us down the mountain so that we could go home and go to work tomorrow. Sigh...so I ask you was this just a case of Deja Vu or a curse? If you select choice B, then it could be the curse of me, or the curse of the Sentra. 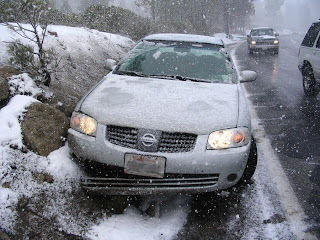 I can only thank God that A) we did not loose control on a section that did not have a guard rail thus sending us careening down the mountain and/or B) that I did not loose control when driving with Caiden on Ortega Highway because there tends NOT to be guard rails. Either way you look at it we were extremely lucky. I'm very glad to hear that you guys were all OK.